Use scrap fabrics to make a unique and eclectic fabric cd holder from Jennifer Neill. These are one-of-a-kind gifts that will be great for Mother's Day crafts and friends' birthdays. Make a funky cd holder for all your music-loving friends! Now, you should have two fabric covered cardboard rectangles. One should have a single fabric covering it and the other should have your layered fabrics covering it. Hot glue the front and back together, just sandwich all the ugly parts inside! Crafter's Note: This could be a cute gift idea wrapped with a new CD. looking for a way to separate my music from my software. FOUND IT! Very nice! It looks like it would be nicer and softer for sliding the cd's in and out. Sometimes the ones you buy are a little rough with the nylon material. This is a great and easy idea. I think I will make several of them. Use one at my desk for all the CD's for my computer programs ( they never come with cases and get scratched and dusty) I think a very large one would be great to keep DVD's in My son has a huge collection of movies but hates to put them in the original cases so this would be great to make several big ones and put on a backboard of some sort with a photo frame and then hang on the wall beside his tv. Thanks for the idea can't wait to get started on these.. Thanks for making this site possible. You've helped me to use my "thinking cap" for a lot of the clutter & repurposing items I have collected for over 40 yrs. My tip for making this project includes 2 ideas, both being used fabric & wallpaper sample books. Whichever you can get, as both would make the holder pretty durable. 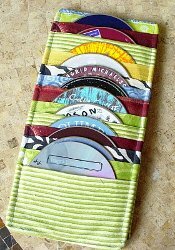 Love this idea and will be using it to make a new CD holder out of a few slightly used placemats. Thanks Jennifer.